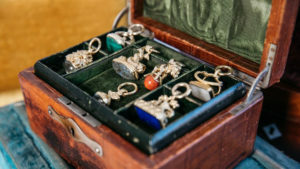 Watch fobs were once an essential accessory for men during the Victorian era; after all, they helped keep valuable pocket watches tethered to their person. Over time, the fobs came to reflect the individuals who carried them; some were etched with family crests, or made with intaglios useful for sealing documents in wax. Now, they’ve been beautifully reimagined into pendant necklaces by Jessica VanDyke Schmidlapp, founder of Charleston, South Carolina-based Dudley VanDyke jewelry. “My first introduction to all things fobs and chains was made 20 years ago while shopping in the Queen Victoria building in Sydney, Australia,” Schmidlapp recalls. “I was on a business trip with my late husband and we came across a fabulous antique sterling silver double Albert chain. I was intrigued. Unbeknownst to me, he picked up this chain on a subsequent trip, a wonderful surprise…and the seed was planted.” Years later, Schmidlapp launched her own jewelry brand and began crafting the chain-and-fob look for contemporary jewelry-lovers. Schmidlapp was inspired by how seamlessly the antique design transitioned into intriguing pendant necklaces. Today, she heads up Dudley VanDyke with her husband, Robert Dudley Calcote (the brand is a combination of their two names). The duo collects eye-catching semi-precious stones at gem fairs around the country and sets them into fresh fobs cast in 14-karat gold and sterling silver.